All manufacturing systems are built with great belief of providing the life time value of end products and conserving the resources in all aspects. This belief is greatly modified when the end-products are subjected to a variety of complex environmental conditions, handling methods and maintenance practices. When water distribution system is designed, it is the interest of water distribution and management to assure every drop of water reaches its destination. In reality, the loss is not only for the quantity, but also the health of people consuming contaminated water. When gas pipelines are laid to cater the demands of energy requirement, it is the belief of designer to supply gas to its destination without impacting the environment and people through technological explosions. In reality, minor changes are the leading causes for real explosions. When process equipment and piping are designed, manufactured, installed and operated to achieve the production rate for maintaining industrial growth, materials are brought to the design table with great confidence for construction. We do not find reference for corrosion in Environmental Impact Assessment. But corrosion control seems to be ecologically pushed to acquire a fresh challenge: Is it eco-friendly control process? The environmental analysis is immediately started with disposal of corrosion control chemicals and release of solvents rather looking at safeguarding the materials to achieve sustainability. Control of material degradation is the present day challenge for material sustainability. Where do we miss the impact of corrosion on environment? If control is technologically applied, leak rate of hazardous substance is profoundly minimised. Footprint is the buzzword for environmental assessment. Carbon footprint is monotonically approached to quantify the effects in all stages of product lifecycle involving variety of materials. Water footprint is calculated to see the life cycle demand. It is quite obvious from the present approach that Corrosion Footprint is not at all attempted. Disposal of corrosion control chemical or metallic deposit is challenged. 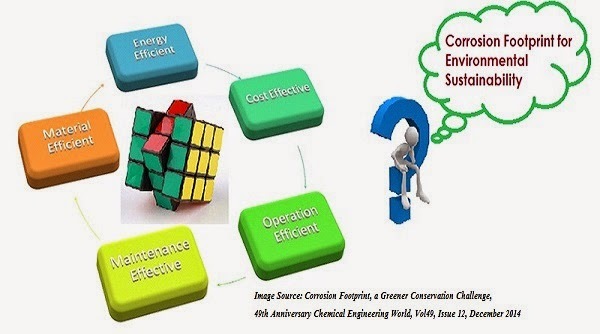 This challenge can be effectively approached through various means: green chemistry innovations for extracting the hidden power of plants, development of economically proven material choices and formulation of conservation-friendly operation and maintenance practices to allow Corrosion Control Performance Index taking its proper berth in Environmental Impact and Life Cycle Assessment. Although we see numerous industrial accidents and significant water loss due to corrosion, we do not consider corrosion as an environmental hazard. Now is the time to start calculating Corrosion Footprint for conserving our precious material resources and achieving environmental sustainability.